Blues fans should make tracks for Matlock Bath this weekend to check out Cry Baby and the Hoochie Coochie Boys. The band will air tracks from their new album when they play at The Fishpond on Saturday, September 5. Cry Baby and The Hoochie Coochie Boys were formed in 2008 by Rob Wilkinson and Graham Sells whose aim was to combine the 50s Chicago r ‘n’ b sound with high energy British blues. Their sound has been heavily influenced by Nine Below Zero and Dr Feelgood. 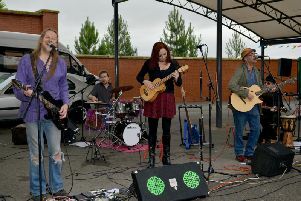 The band started gigging around the Potteries and recorded their Salt Glazed Blues – EP at Tremolo Studios in Stoke-On-Trent. The EP included two original songs written by Graham Sells - Don’t Lie To Me Baby and Ain’t Nothing But The Blues. The group’s name is a nod towards Muddy Waters while Rob’s old time harmonica playing and a wailing tone adds the Cry Baby element. Cry Baby and the Hoochie Coochie Boys is composed of Rob Wilkinson on vocals and harp, Vince Cutcliffe on guitar and vocals, Andy Carr on drums and vocals, Mark Hargreaves on keyboards and vocals and Chris Bevington on bass.